Being active on social media is such an important part of blogging success – but it can lead to a lot of wasted time if you don’t have a solid plan. Fortunately, there are a lot of tools we can use to save time on social media – while keeping our platforms truly engaging. Here are some of my favorite tips and tools for streamlining social media – gathered over 7 years of managing social media for my own blog and others’! If you’re managing your blog and social media on your own, it’s probably best not to try to be everywhere. Don’t be fooled into thinking that you absolutely must be on Facebook, Twitter, Instagram, Google+, Pinterest, Tumblr, and even all the new social media networks that pop up. You’ll be much more effective if you put the same amount of energy into focusing on your ideal readers’ favorite networks rather than spreading yourself too thin across all of them. To decide, just think about the content you see doing best on each platform – and the platform you enjoy most! You can use apps like Buffer or Hootsuite to schedule social media messages on Twitter, Facebook, and Google+. A lot of bloggers love CoSchedule for scheduling shares and future reshares of their content, too! Since each app has a free option or at least a trial period, I recommend using each of them for a couple days to see which one you like best, since everyone works differently. I personally love Buffer, but I’m warming up to CoSchedule and I know others who swear by Hootsuite, even though I find it really clunky. Viraltag is an app you can use to schedule pins (and repins!) on Pinterest, and to upload many pins at once more efficiently. I especially love using it to schedule pins right when my posts go live. Then I come back and schedule repins to group boards. While you can’t exactly schedule Instagram updates, you can set up Instagram reminders with Crowdfire (The smartphone app formerly known as JustUnfollow!). I am loving this tool, because it automatically chooses the best time to remind you to post on Instagram based on when your followers are most active. It also suggests hashtags to use with your update, too, though that feature could use some improvement. I like to schedule updates weekly – usually on Sunday or Monday – so then it’s done and I can focus on engagement during the rest of the week. Some people like to spend a few minutes each day scheduling updates, though, which is definitely ideal if you have more timely content to share. You’ll know which option is better for you and your readership. Sharing your own content on social media is a no-brainer, but it’s really important to share relevant content from others, too! You can cut down on the amount of time spent searching for good content to share by setting up a steady incoming stream to choose from. Use Buffer feeds. One of the reasons I love Buffer for scheduling is that you can add feeds to easily share updates from. I have 15 blog feeds set in Buffer that I love and that all create similar content to mine, so there is always great stuff to share that I know my readers will love. You can easily use the same tactic by using any RSS feeder to subscribe to blogs in your niche and grab content to share from one place. The Pocket app works across your smartphone and browser – it’s sort of a streamlined bookmarking service. I use this to save content I find throughout the week that I know I’ll want to share. During my weekly scheduling sessions, I have them all in one place and can easily share and delete them from the pool as I go. I also use Pocket to save content I need to share from the support threads I participate in with other bloggers. Although all these tips will help you save time on your social media marketing, we can’t forget: It’s social media! It can’t be completely automated. We have to remember that behind the metrics, the numbers, the “likes” and “followers” are REAL readers – people who deserve a real relationship, not a robotic one! So, set aside time for responding to comments, interacting with others each day – you know, being “social!” Ideally this would be during the time when your network is most active. Do you feel like your social media routine is efficient? 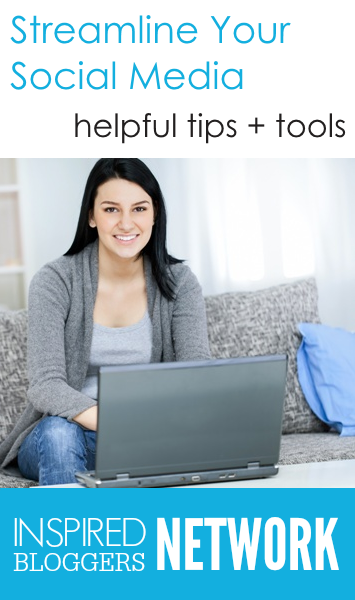 Which of these tips or tools will you start using? Great post. Thanks for mentioning CoSchedule, we really appreciate it!